A privacy fence could be the perfect addition to your landscape! Your landscape is flourishing, and your garden has been yielding the fruits (and vegetables) of your labor. 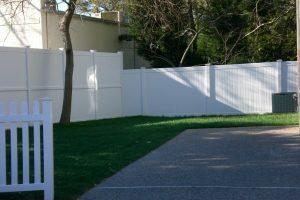 Enhance the overall design and appeal of your yard by adding a privacy fence. Not only will it protect your landscape from outsiders, but it will also give you more opportunity to decorate the space. Use the fence as a platform on which to add more height and dimension to your property. Paint it a color that complements your home or choose a stain that will make your flowers and plants stand out. There is quite a variety of styles and materials that make up the privacy fence market. Therefore, you won’t have any problem finding the perfect look to complement your personal style and environmental needs. Depending on the climate in which you live, some materials are better suited to withstand the weather than others. Many of the styles are also made with sustainable materials that help reduce your carbon footprint. It all depends on your lifestyle and other customizable features. Privacy fences go a long way toward keeping your children and animals safe on your property while thwarting the attempts of would-be intruders and burglars. It makes your home less visible to the street, meaning that passersby will have a much harder time seeing inside your windows, which in turn makes your home less attractive as a potential target. In terms of your children and pets, you’ll have a much higher peace of mind allowing them to play and run around your property without balls or other toys rolling into the street with them chasing behind. These days, all types of fences are being designed with the owner in mind. Many owners are looking for options that require little to no maintenance. The materials can be protected with a couple of coats of varnish, and often just need surface cleaning with warm water and mild soap to remove debris that builds up over time. This entry was posted on Thursday, March 22nd, 2018 at 7:15 pm. Both comments and pings are currently closed.